Samsung which is currently believed to the highest Smartphones Seller in the World is now providing a Remote tracking solution in all its smartphones to Track the lost phone with the name "Samsung Dive". The Service is based on the Architecture which primarily acquires precise location of the smart phone using it GPS and other subsidiary location acquisition techniques. The Service is basically meant to be used by the users to track their phone in case of theft or lost phone. Security Researcher Jiten Jain discovered that this GPS based location tracking service provided by manufacturer (Samsung) is also vulnerable to Theft and Malwares. To use this inbuilt tracking Service, User has to simply create an account with Samsung (www.samsungdive.com). Users than have to enable remote services to track device and wipe data remotely. The permission can be disabled or modified only by the Samsung account holder after logging in and cannot be disabled by anyone else. When a user wants to track his device, He simply has to log on to Samsung tracking Service website "www.samsungdive.com" and just press track my device button. The application will then remotely connect to the lost device and switch on its GPS receiver automatically and acquire the precise location of device. In case of GPS unavailability other subsidiary location acquisition techniques like Wi-Fi or cell tower triangulation may be used. The acquired location is then sent to the Server and shown on a Map to the User. During Research Mr. Jain found that this location based tracking Service provided by Device Samsung in its Android based Smartphones is completely vulnerable to Location Spoofing Attacks. Which means in case of Phone theft the Thief can simply broadcast a fake location on Samsung tracking server and mislead Original Phone User/Owner to believe that the phone is genuinely at fake location. The locations can be faked continuously to random places anywhere in the world. All this happens because Samsung’s Location API's are completely vulnerable to be manipulated by installing commonly available simple GPS location spoofer on the device. To demonstrate this flaw a simple easily available location spoofing app was installed in the targeted Device in Delhi and Spoof Location was set to somewhere in Jordan. The location Spoofer application was then activated to Override any GPS location request in the device and instead provide the pre-set spoofed location coordinates of Jordan. Then Samsung’s Device tracking Service was used to track the Targeted Device. 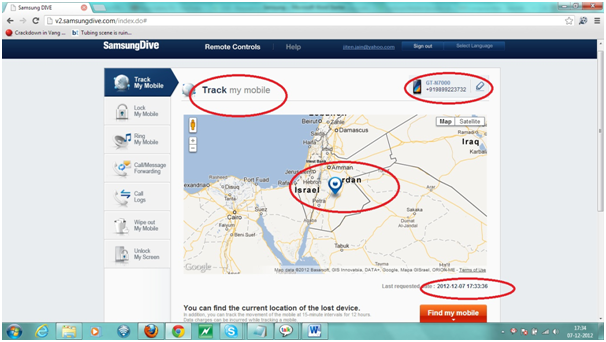 The Location shown on the Samsung's Device Tracking Map on Web Interface showed that Phone was Indeed in Jordan. Pictures of Spoofed Location of a Samsung Galaxy Note are shown below. Apart from this Location spoofing Vulnerability, To make thing worse, Samsung tracking application also shows notification that device is being tracked remotely. This simply alerts the hacker or thief. This defeats the very fundamental principal and purpose of a tracking application, which should always work on the principal of hidden remote tracking in case of theft. This leaves Millions of Samsung smartphone owners who rely on Samsung’s tracking service vulnerable and helpless and in case of phone theft. Since Samsung's Location API's are so vulnerable to location spoofing attacks, This vulnerability may well be Used by malware writers to remotely spoof the location of a device, Which will throw the Navigation applications like Google Maps show the incorrect current location and wrong crazy Routes to destinations and it may also be well used by an hackers to write malwares to throw Location based services on the device in complete disarray. Hope Samsung comes up with a fix before your location is spoofed.